Alright, so we got this giant organic zucchini at a local farmers market for $1. Once I got over that excitement [Yes, these are the things I get pumped about] I searched for inspiration on what to make. 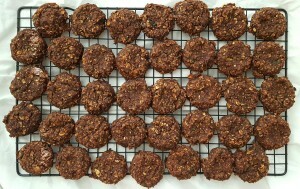 My first recipe with this monster was soft and chewy chocolate “cookies”. These cookies are refined sugar free, dairy free, and oil free. I sweetened these beauties with 2 ripe bananas, medjool dates, and an apple, so there is no room [or want] for refined, processed granulated sugar. Using parchment paper on a cookie sheet means no oil needed! Win. Some say you should discard the seeds when zucchinis get this big because they “are bitter and don’t taste good”… but I’m a little daredevil and I kept the seeds… and the skin too. I am glad I did, because they are delicious + no nutrients are lost! This recipe uses 2 cups finely shredded zucchini, so I only used about 1/5 of the vegetable. What a good buy. Thank you, farmers market! Grind almonds into a meal. Combine bananas, dates, apple in a high powered food processor and blend until smooth. Add all ingredients to the dry mix and stir until well mixed. Using a spoon or small ice cream scoop, place spoonful on parchment paper on a cookie sheet, and press to flatten just a little. Bake on 400* degrees for 30 minutes. This is one of my all time favorite desserts. 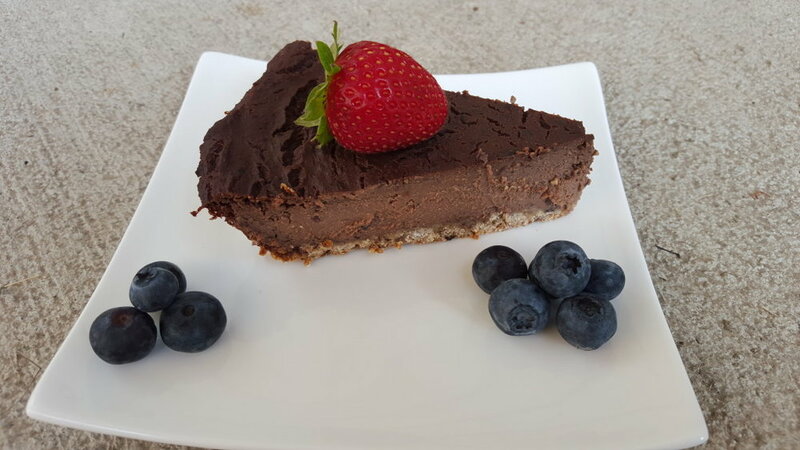 Guilt free with consistency of cheesecake, you’ll come back for seconds… just don’t eat the entire pie in one sitting! And guys, tofu gets such a bad rap. Not anymore. Not when there is cheesecake involved. [And PS: Organic + non-GMO tofu is perfectly fine and healthy for you]. All you need for this delicious recipe is 7 simple ingredients, a glass pie dish, high powered blender, an hour to bake [browse our other recipes while it’s in the oven]. It’s best to let the this dish firm up in the fridge overnight – trust me, that’s the hardest part! BUT you get to enjoy a slice with your breakfast… why not? Combine crust ingredients in a Ninja or other high powered food processor and blend. Crust will be sticky. Add a little more water if it's too dry and crumbly. Form into a glass pie dish or 8x8 glass baking dish. Bake crust on 350 degrees for 8 minutes. Add 16 dates and ½ cup water in a bowl and microwave for 1 minute. Combine the microwaved dates and water with the remaining filling ingredients in the high powered blender and blend until smooth. Pour filling onto crust and bake on 350 degrees for 1 hour. Cover with lid or paper towels and refrigerate overnight to let firm up. *For a more sweet filling, add a few additional dates. If using small deglet noor dates, double number of dates.